Requirements: Compatible with iPhone 4, iPhone 4S, iPhone 5, iPod touch (4th generation), iPod touch (5th generation), iPad 2 Wi-Fi, iPad 2 Wi-Fi + 3G, iPad (3rd generation), iPad Wi-Fi + 4G, iPad (4th generation), iPad Wi-Fi + Cellular (4th generation), iPad mini and iPad mini Wi-Fi + Cellular. Requires iOS 4.0 or later. Photo Guard does the protecting images and Drawing an entangled line for a pattern lock is faster than entering a bulky passcode. In addition, if anyone tries to access the locked pictures, Photo Guard makes a shot. Thus it enables you to take precautions against the snoopy ones. Photo Guard is also the secure photo manager for your device. You don’t need any other tool to handle your picture library. 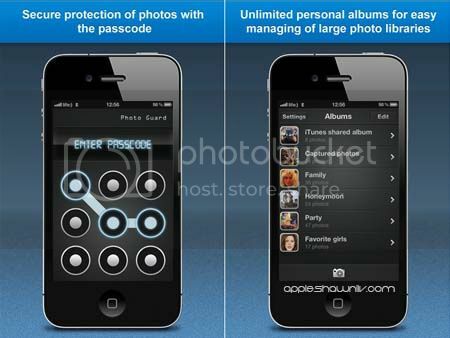 Easy private albums managing, photos viewing and sharing make Photo Guard perfect for iPhonographers.